1 Animals and plants have internal communication systems that allow information to pass between different parts of their bodies, and so help them to respond to changes in their external and internal environments. 2 Mammals keep their internal environment relatively constant, so providing steady and appropriate conditions within which cells can carry out their activities. This is known as homeostasis. 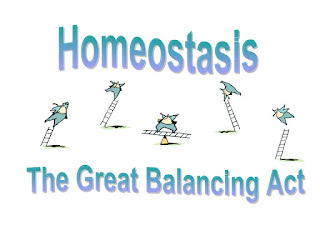 3 Homeostatic equilibrium requires receptors that detect changes in physiological parameters such as the temperature, water potential and pH of the blood. Effectors are the cells, tissues and organs that carry out the functions necessary to restore those parameters to their set points. Homeostatic control systems use negative feedback in which any change in a parameter stimulates actions by effectors to restore the parameter to its set point. 4 Excretion is the removal of toxic waste products of metabolism, especially carbon dioxide and urea. The deamination of excess amino acids in the liver produces ammonia, which is converted into urea, the main nitrogenous waste product. Urea is excreted in solution in water, as urine. 5 The kidneys regulate the concentration of various substances in the body fluids, by excreting appropriate amounts of them. Each kidney is made up of thousands of nephrons and their associated blood vessels. The kidneys produce urine by ultrafiltration and reabsorption, plus some secretion of unwanted substances. Different regions of a nephron have different functions, and this is reflected in the structure of the cells that make up their walls. 6 Blood is brought to the glomerulus in an afferent arteriole. High hydrostatic pressure in the glomerulus forces substances through the capillary walls, the basement membrane and inner lining of Bowman’s capsule. The basement membrane acts as a filter, allowing only small molecules through. This filtrate collects in Bowman’s capsule and then enters the proximal convoluted tubule, where most reabsorption occurs by diffusion and active transport; substances are also reabsorbed in the distal convoluted tubule and collecting duct. The loop of Henle acts as a counter-current multiplier, producing high concentrations of sodium and chloride ions in the tissue fluid in the medulla. This tissue has a very low water potential. Water is reabsorbed from fluid in the collecting duct by osmosis if the body is dehydrated. 7 The water content of the blood is controlled by changing the amount of water excreted in the urine by the kidneys. This is done by regulating the permeability of the walls of the collecting ducts to water, and hence the volume of water reabsorbed from the collecting ducts into the blood. The permeability is increased by the hormone ADH, which is secreted by the posterior pituitary gland in response to stimulation of osmoreceptors in the hypothalamus. 8 Neurones are cells adapted for the rapid transmission of electrical impulses. Sensory neurones transmit impulses from receptors to the central nervous system (brain and spinal cord); motor neurones transmit impulses from the central nervous system to eff ectors; intermediate neurones transmit impulses within the central nervous system. The three neurones are found in series in reflex arcs that control fast, automatic responses to stimuli. In vertebrates, the axons of many neurones are insulated by a myelin sheath, which speeds up transmission. 9 Neurones have a resting potential, which is a potential difference across their membranes, with the inside having a negative potential compared with the outside; this potential difference is about −65 mV. An action potential is a rapid reversal of this potential, caused by changes in permeability of the cell surface membrane to potassium and sodium ions. Action potentials are always the same size. 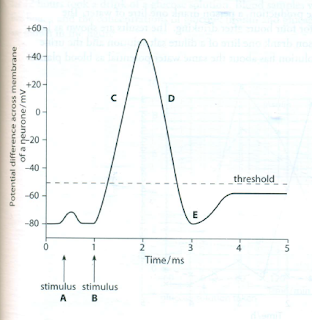 Information about the strength of a stimulus is given by the frequency of action potentials produced. 10 Action potentials are propagated along axons by local circuits that depolarise regions of membrane ahead of the action potential. This depolarisation stimulates sodium ion voltage-gated channels to open, so that the permeability to sodium increases and the action potential occurs further down the axon. Axons are repolarised by the opening of potassium ion voltagegated channels that allow potassium ions to diffuse out of the axon. After a short refractory period when the sodium channels cannot open, the membrane is able to respond again. Refractory periods determine the maximum speed of impulses. 11 Action potentials may be initiated within the brain or at a receptor. Receptors respond to information from the environment. Environmental changes result in permeability changes in the membranes of receptor cells, which in turn produce changes in potential diff erence across the membrane. If the potential difference is sufficiently great and above the threshold for the receptor cell, this will trigger an action potential in a sensory neurone. Receptors are transducers converting the energy of stimuli into electrical impulses. 12 A synapse is a junction between two neurones or between a motor neurone and a muscle cell. At cholinergic synapses, a transmitter substance, acetylcholine, is released when action potentials arrive. Impulses pass in one direction only, because transmitter substances are released by exocytosis by the presynaptic neurone to bind to receptor proteins that are only found on the postsynaptic neurone. 13 Any one neurone within the central nervous system is likely to have at least several hundred synapses with other neurones, some of which will be stimulatory and some inhibitory. This allows integration within the nervous system, resulting in complex and variable patterns of behaviour, and in learning and memory. 14 Hormones are chemicals that are made in endocrine glands and transported in blood plasma to their target cells, where they bind to specific receptors and so affect the behaviour of the cells. 15 The concentration of glucose in the blood is controlled by the action of insulin and glucagon, which are secreted by the islets of Langerhans in the pancreas and aff ect liver and muscle cells. 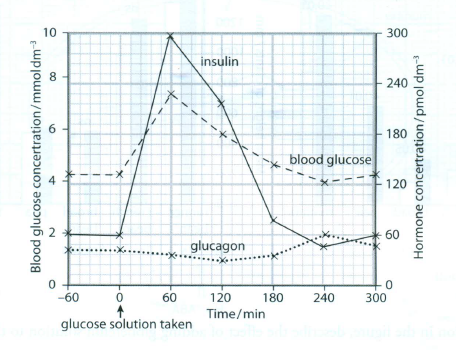 The use of negative feedback keeps the blood glucose concentration near the set point. 16 Plants produce several chemicals known as plant growth substances that are involved in the control of growth and responses to environmental changes. Auxin is synthesised mainly in growing tips of shoots and roots, and appears to be involved in preventing the growth of lateral buds when an intact and active apical bud is present. Gibberellin is synthesised in young leaves and in seeds. It stimulates growth of stems and germination of seeds such as those of wheat and barley. Abscisic acid is synthesised by any cells in a plant that contain chloroplasts or amyloplasts, especially in stress conditions. The presence of large concentrations of abscisic acid in leaves causes stomata to close. 1 Which of the following is an incorrect statement about the endocrine system? A All hormones bind to receptors on the cell surface of their target cells. B Endocrine glands are ductless. C Endocrine glands secrete hormones into the blood. D Hormones are transported in the blood plasma. 3 Which of the following is responsible for saltatory conduction in myelinated neurones? 4 Which of the following correctly identifies the effects of the three plant hormones,abscisic acid (ABA), auxin and gibberellin? 5 The figure shows the changes in potential difference across the membrane of a neurone over a period of time. The membrane was stimulated at time A and time B with stimuli of different intensities. 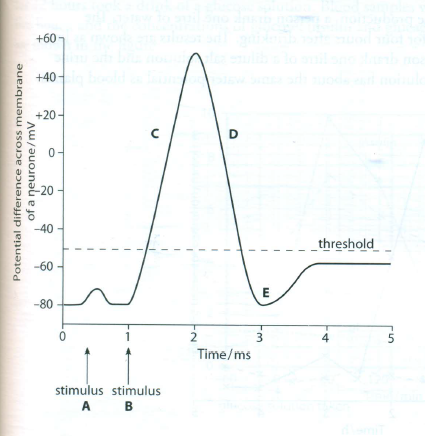 a Stimulus B resulted in an action potential. 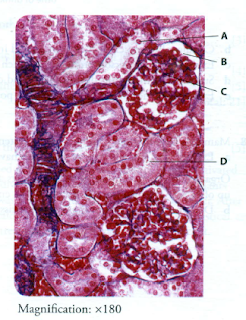 b The figure is a photomicrograph of part of the kidney. 7 The control of the water content of the blood is an example of homeostasis. In an investigation of the factors that influence urine production, a person drank one litre of water. The person's urine was collected at half-hourly intervals for four hours after drinking. The results are shown as line A on the figure. 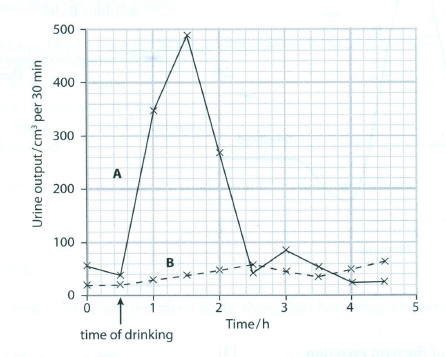 On the following day, the same person drank one litre of a dilute salt solution and the urine was collected in the same way (line B). Dilute salt solution has about the same water potential as blood plasma. e Explain why negative feedback, and not positive feedback is involved in homeostatic mechanisms. 8 Mammals have internal communication systems for signalling between cells. Organs that secrete substances through ducts are known as exocrine glands. Most of the pancreas is made up of exocrine tissue. The rest, about 2%, is endocrine tissue which secretes insulin and glucagon. An investigation was carried out to determine the response of pancreatic cells to an increase in the glucose concentration of the blood. A person who had been told not to eat or drink anything other than water for 12 hours took a drink of a glucose solution. Blood samples were taken from the person at one hour intervals for five hours, and the concentrations of glucose, insulin and glucagon in the blood were determined. The results are shown in the figure. 9 Gibberellin is a plant growth regulator. In an investigation of the effects of gibberellin, plants of short-stemmed and long-stemmed varieties of five cultivated species were grown from seed. The young plants of each species were divided into two groups. One group of plants was sprayed with a solution of gibberellin each day. A control group was sprayed with the same volume of water. After eight weeks, the stem length of each plant was measured and means calculated for each group of plants. A statistical test was carried out to determine whether the difference between the treatments for each species was significant. The results are shown in the figure. The p value for each species is given. 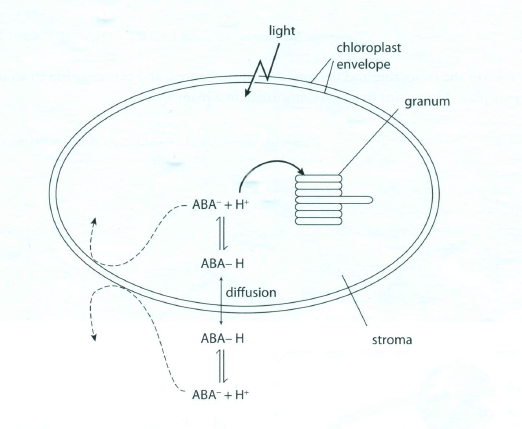 ABA-H can diffuse into and out of chloroplasts, but ABA- cannot. This information is summarised in the figure. a Using all the information provided, predict what happens to the pH in the stroma in the light. Cambridge International Examinations bears no responsibility for the example answers to questions taken from its past question papers which are contained in this publication.